Many of Buddhism's core tenets significantly overlap with findings from modern neurology and neuroscience. So how did Buddhism come close to getting the brain right? Over the last few decades many Buddhists and quite a few neuroscientists have examined Buddhism and neuroscience, with both groups reporting overlap. I’m sorry to say I have been privately dismissive. One hears this sort of thing all the time, from any religion, and I was sure in this case it would break down upon closer scrutiny. When a scientific discovery seems to support any religious teaching, you can expect members of that religion to become strict empiricists, telling themselves and the world that their belief is grounded in reality. They are always less happy to accept scientific data they feel contradicts their preconceived beliefs. No surprise here; no human likes to be wrong. But science isn’t supposed to care about preconceived notions. Science, at least good science, tells us about the world as it is, not as some wish it to be. Sometimes what science finds is consistent with a particular religion’s wishes. But usually not. Despite my doubts, neurology and neuroscience do not appear to profoundly contradict Buddhist thought. Neuroscience tells us the thing we take as our unified mind is an illusion, that our mind is not unified and can barely be said to “exist” at all. Our feeling of unity and control is a post-hoc confabulation and is easily fractured into separate parts. As revealed by scientific inquiry, what we call a mind (or a self, or a soul) is actually something that changes so much and is so uncertain that our pre-scientific language struggles to find meaning. 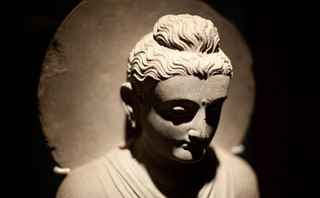 When considering a Buddhist contemplating his soul, one is immediately struck by a disconnect between religious teaching and perception. While meditating in the temple, the self is an illusion. But when the Buddhist goes shopping he feels like we all do: unified, in control, and unchanged from moment to moment. The way things feel becomes suspect. And that’s pretty close to what neurologists deal with every day, like the case of Mr. Logosh. Mr. Logosh was 37 years old when he suffered a stroke. It was a month after knee surgery and we never found a real reason other than trivially high cholesterol and smoking. Sometimes medicine is like that: bad things happen, seemingly without sufficient reasons. In the ER I found him aphasic, able to understand perfectly but unable to get a single word out, and with no movement of the right face, arm, and leg. We gave him the only treatment available for stroke, tissue plasminogen activator, but there was no improvement. He went to the ICU unchanged. A follow up CT scan showed that the dead brain tissue had filled up with blood. As the body digested the dead brain tissue, later scans showed a large hole in the left hemisphere. Although I despaired, I comforted myself by looking at the overlying cortex. Here the damage was minimal and many neurons still survived. Still, I mostly despaired. It is a tragedy for an 80-year-old to spend life’s remainder as an aphasic hemiplegic. The tragedy grows when a young man looks towards decades of mute immobility. But you can never tell with early brain injuries to the young. I was yoked to optimism. After all, I’d treated him. The next day Mr. Logosh woke up and started talking. Not much at first, just ‘yes’ and ‘no.’ Then ‘water,’ ‘thanks,’ ‘sure,’ and ‘me.’ We eventually sent him to rehab, barely able to speak, still able to understand. One year later he came back to the office with an odd request. He was applying to become a driver and needed my clearance, which was a formality. He walked with only a slight limp, his right foot a bit unsure of itself. His voice had a slight hitch, as though he were choosing his words carefully. When we consider our language, it seems unified and indivisible. We hear a word, attach meaning to it, and use other words to reply. It’s effortless. It seems part of the same unified language sphere. How easily we are tricked! Mr. Logosh shows us that unity of language is an illusion. The seeming unity of language is really the work of different parts of the brain, which shift and change over time, and which fracture into receptive and expressive parts. How did Buddhism get so much right? I speak here as an outsider, but it seems to me that Buddhism started with a bit of empiricism. Perhaps the founders of Buddhism were pre-scientific, but they did use empirical data. They noted the natural world: the sun sets, the wind blows into a field, one insect eats another. There is constant change, shifting parts, and impermanence. They called this impermanence anicca, and it forms a central dogma of Buddhism. Early on, Buddhism grasped the nature of worldly change and divided parts, and then applied it to the human mind. The key step was overcoming egocentrism and recognizing the connection between the world and humans. We are part of the natural world; its processes apply themselves equally to rocks, trees, insects, and humans. Perhaps building on its heritage, early Buddhism simply did not allow room for human exceptionalism. I should note my refusal to accept that they simply got this much right by accident, which I find improbable. Why would accident bring them to such a counterintuitive belief? Truth from subjective religious rapture is also highly suspect. Firstly, those who enter religious raptures tend to see what they already know. Secondly, if the self is an illusion, then aren’t subjective insights from meditation illusory as well? I don’t mean to dismiss or gloss over the areas where Buddhism and neuroscience diverge. Some Buddhist dogmas deviate from what we know about the brain. Buddhism posits an immaterial thing that survives the brain’s death and is reincarnated. After a person’s death, the consciousness reincarnates. If you buy into the idea of a constantly changing immaterial soul, this isn’t as tricky and insane as it seems to the non-indoctrinated. During life, consciousness changes as mental states replace one another, so each moment can be considered a reincarnation from the moment before. The waves lap, the sand shifts. If you’re good, they might one day lap upon a nicer beach, a higher plane of existence. If you’re not, well, someone’s waves need to supply the baseline awareness of insects, worms, and other creepy-crawlies. The problem is that there’s no evidence for an immaterial thing that gets reincarnated after death. In fact, there’s even evidence against it. Reincarnation would require an entity (even the vague, impermanent one called anatta) to exist independently of brain function. But brain function has been so closely tied to every mental function (every bit of consciousness, perception, emotion, everything self and non-self about you) that there appears to be no remainder. Reincarnation is not a trivial part of most forms of Buddhism. For example, the Dalai Lama’s followers chose him because they believe him to be the living reincarnation of a long line of respected teachers. Why have the dominant Western religious traditions gotten their permanent, independent souls so wrong? Taking note of change was not limited to Buddhism. The same sort of thinking pops up in Western thought as well. The pre-Socratic Heraclitus said, “Nothing endures but change.” But that observation didn’t really go anywhere. It wasn’t adopted by monotheistic religions or held up as a central natural truth. Instead, pure Platonic ideals won out, perhaps because they seemed more divine. Western thought is hardly monolithic or simple, but monotheistic religions made a simple misstep when they didn’t apply naturalism to themselves and their notions of their souls. Time and again, their prominent scholars and philosophers rendered the human soul exceptional and otherworldly, falsely elevating our species above and beyond nature. We see the effects today. When Judeo-Christian belief conflicts with science, it nearly always concerns science removing humans from a putative pedestal, a central place in creation. Yet science has shown us that we reside on the fringes of our galaxy, which itself doesn’t seem to hold a particularly precious location in the universe. Our species came from common ape-like ancestors, many of which in all likelihood possessed brains capable of experiencing and manifesting some of our most precious “human” sentiments and traits. Our own brains produce the thing we call a mind, which is not a soul. Human exceptionalism increasingly seems a vain fantasy. In its modest rejection of that vanity, Buddhism exhibits less error and less original sin, this one of pride. How well will any religion apply the lessons of neuroscience to the soul? Mr. Logosh, like every person who’s brain lesion changes their mind, challenges the Western religions. An immaterial soul cannot easily account for even a stroke associated with aphasia. Will monotheistic religions change their idea of the soul to accommodate data? Will they even try? It is doubtful. The rigid human exceptionalism is cemented firmly into dogma. Will Buddhists allow neuroscience to render their idea of reincarnation obsolete? This is akin to asking if the Dalai Lama and his followers will decide he’s only the symbolic reincarnation of past teachers. This is also doubtful, but Buddhism’s first steps at least made it possible. Unrelated to neuroscience and neurology, in 1969 the Dalai Lama said his “office was an institution created to benefit others. It is possible that it will soon have outlived its usefulness.” Impermanence and shifting parts entail constant change, so perhaps it is no surprise that he’s lately said he may choose the next office holder before his death. Buddhism’s success was to apply the world’s impermanence to humans and their souls. The results have carried this religion from ancient antiquity into modernity, an impressive distance. With no fear of impermanent beliefs or constant change, how far will they go?